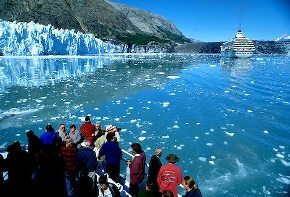 This spectacular national park and preserve displays massive glaciers that stretch 3.2 million acres in south eastern Alaska, this treasure trove of scenic coastal islands, narrow fjords and substantial wildlife offers an inspirational glimpse of what Mother Nature does best.. It also possesses the highest concentration of tidewater glaciers on the planet. With such a brilliantly diverse landscape, the park provides a variety of habitats for animals, big and small which you may be lucky enough to see on your cruise! Large colonies of seabirds, migrating ducks and geese, black bears, seals, sea lions, porpoises and whales are some of the possibilities.